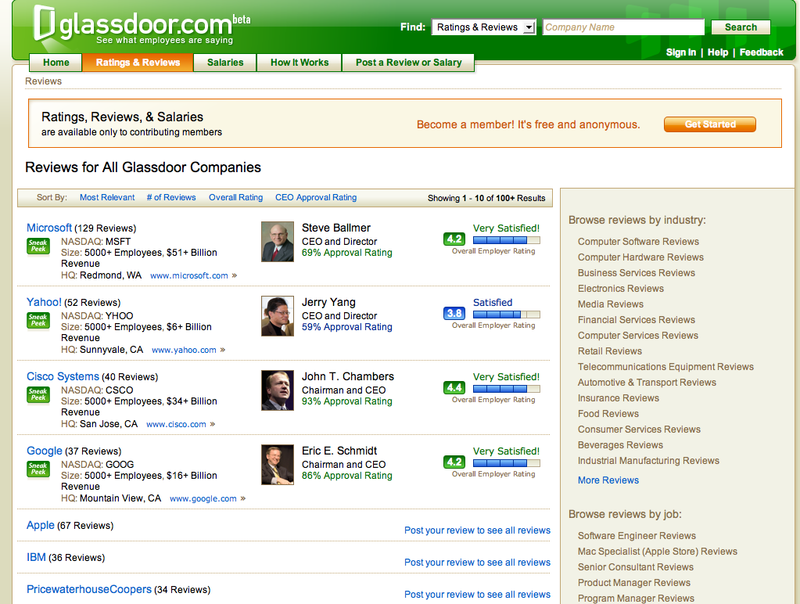 At Glassdoor, Find Out How Much People Really Make At Google, Microsoft, Yahoo, And Everywhere Else. 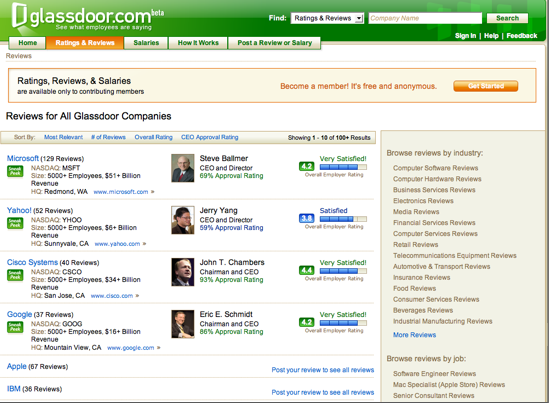 The idea behind Glassdoor is simple: You tell me your salary, and I’ll tell you mine. The stealth startup, which raised $3 million from Benchmark Capital last March, just went live. The site collects company reviews and real salaries from employees of large companies and displays them anonymously for all members to see. (The startup plans to make money from ads targeted at job seekers, premium services, and aggregated compensation data it wants to sell to HR professionals). The idea is to collect as much detailed salary information and feedback for every job title at a company so that job seekers can know how to evaluate an offer, and current employees can see how they are doing relative to their peers. “When the annual compensation review comes,” says CEO Robert Hohman, “you need to know what your market value is.” Or you can just live vicariously through others. 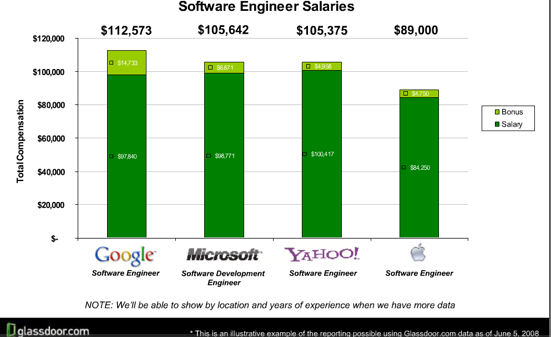 So how much does a Google software engineer really make? The average, based on ten submissions, is $97,840. And the range is between $80,000 and $150,000, with annual cash bonuses coming in anywhere from $20,000 to $45,000. 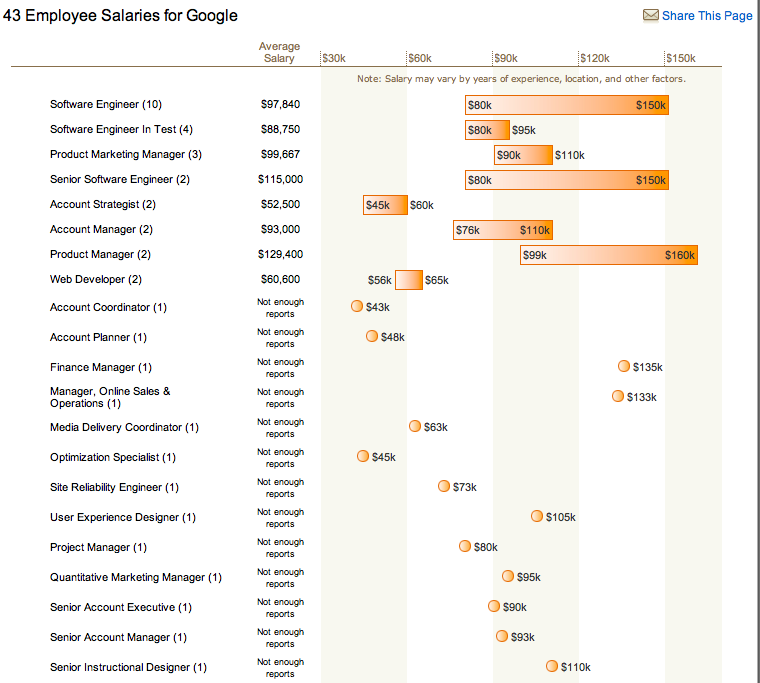 Adding salary and bonus together, the Google engineers that have entered information on Glassdoor average $112,573 in take-home pay. (And then there are stock options on top of that). 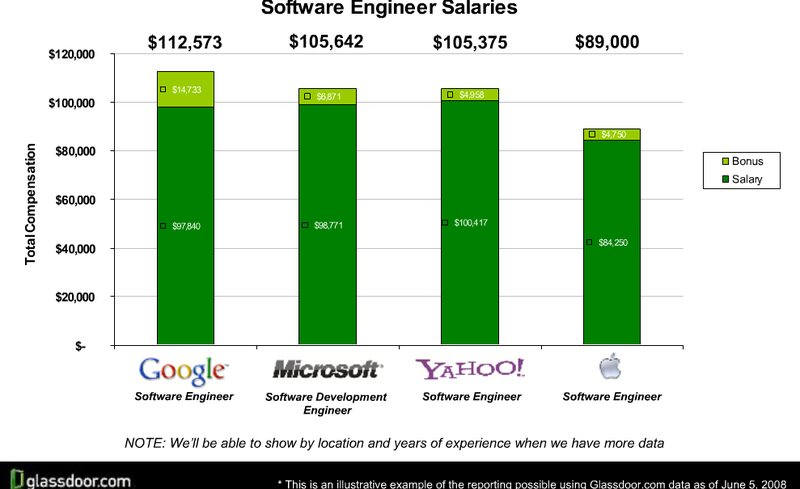 Yahoo and Microsoft engineers get about the same salaries, but smaller bonuses, leaving their take-home pay at an average of $105,642 and $105,375, respectively. Apple software engineers make only about $89,000, on average, but they get to create some of the most loved products on Earth. 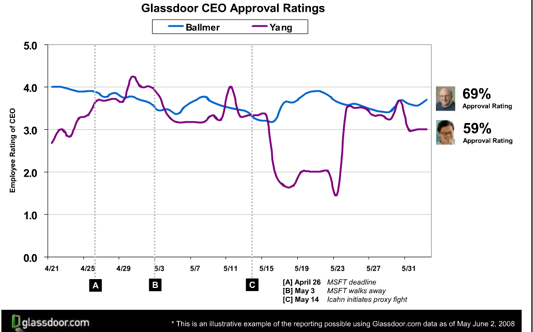 Google CEO Eric Schmidt’s approval rating, incidentally, is 89 percent. 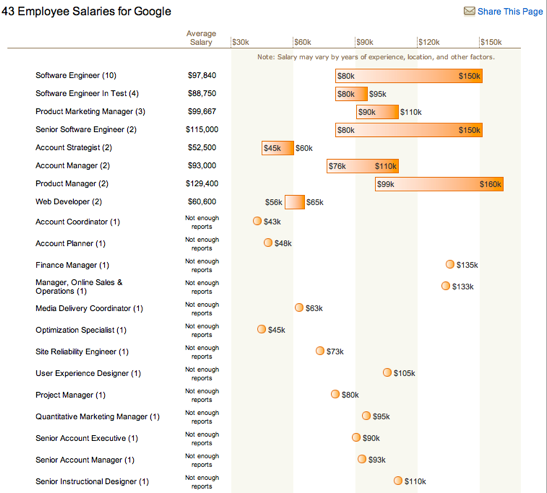 While the overall satisfaction rating for Google as a company to work at is 4.2 out of 5. Microsoft’s satisfaction rating is exactly the same, whereas Yahoo’s is not surprisingly lower at 3.8. These ratings are by no means scientific. They are based on 124 responses for Microsoft, 50 for Yahoo, and 37 for Google, all collected during the company’s private beta. The more honest responses the site collects from any given company, the more accurate the results will be. If you enjoy your individuality and time alone, Google is not the place for you (keep in mind I’m not an engineer). Google pushes a highly “googley” atmosphere, which is something akin to what the Brady Bunch would be like if they lived in communist Russia. . . . People are encouraged to have googley attitudes, wear plastic smiles, and not to question the infallible nature of the executive management group. . . . If you like feeling awkward during forced group activity, Google is your haven. It isn’t exactly “forced” (no guns), but if you don’t participate you become labeled as “ungoogley.” Once deemed “ungoogley”, you’re practically viewed as a rotten apple that threatens to spoil the bunch. “Stop acting as those you’re King Midas…just because you struck it rich with AdWords does not mean whatever you create will be tech gold. For a company that prides itself on innovation, I can’t think of any product Google has released since AdWords that has been truly innovative…unless you are calling Google’s mergers and acquisitions innovative (just because Google owns YouTube does not mean you can take credit for the innovation). Someone is obviously bitter, but it doesn’t make what this person says any less true. (Assuming it truly is a Google employee—there is no way to know for sure). Most of the reviews for Google are positive. Reading through all of them gives a nice cross section of attitudes at the company. Who knew that the heated toilet seats at Google were such a big draw? Or that Netflix has a don’t ask, don’t tell vacation policy? (You take one whenever you can). 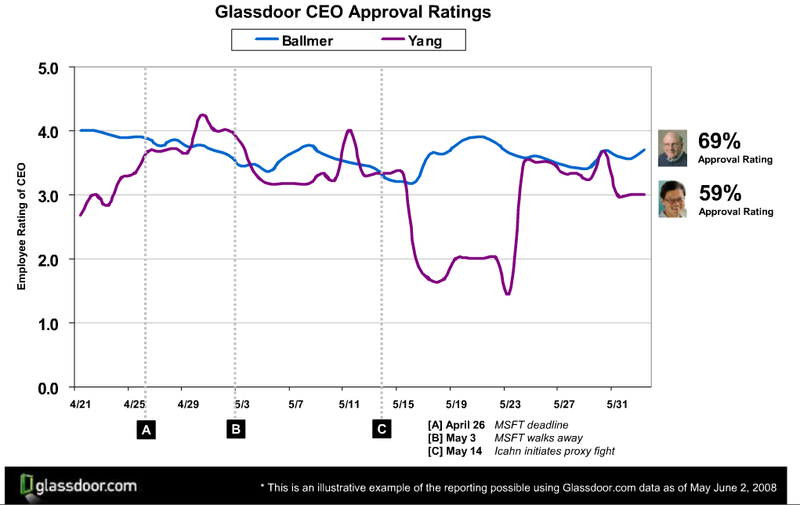 If Glassdoor can get people to fess up about their salaries and the inner workings of their companies, the Internet’s culture of transparency will claim another stronghold.